To Know more about the land and history of the bible is imperative to understanding the bible itself. I encourage you to familiarize yourself with tools like this book... discovery and renewal are in store for you as you explore the biblical sites with this aid, The holy land of Jesus. Let your heart be warmed and opened to fresh insight as the scriptures come alive. God has revealed himself by speaking to man in a rather limited region of the earth that is called Holy Land.. i find this book.. can be of great help to prepare projected visit to Israel or convey a deeper appreciation of the sites after they had been visited... Reading this book attentively could widen your religious horizons and stretch out before you a panorama of faith and history, which will enrich your life. When you read about the cave at the end of Ephron's field, do you ever imagine what that actually looked like? Ever wonder if the field is still there? Do you envision the garden as you read Jesus' prayer? Or visualize the path that he walked as he carried the cross? It is difficult to picture the surroundings in which Jesus and all of his biblical predecessors lived and preached, especially so if one has never seen the drastically different landscape, wildlife, and architecture of the Middle East. And while it's good for children to let their imaginations wander, adults really should know just how and where such important events took place. That is why DOKO Media commissioned the creation of three separate, feature-length films that carry one through the stories of the Bible and the history of the Holy Land. 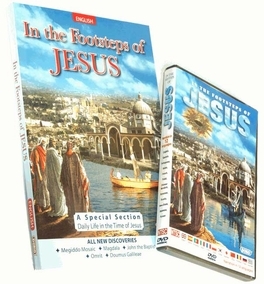 "In the Footsteps of Jesus" guides you through the life, teachings, sojournings, and miracles of Jesus, from birth to presentation at the Temple, from Nazareth to Bethany, from the Mount of Olives to Calvary. Educational and inspirational narration tells the stories of each holy place in the words of the Bible along the way, transforming what might have once seemed like distant and ancient episodes into very real, very modern lessons for the present. It is a good thing to have read the Bible. But it is a hard book to really know unless one has been to its home, has seen what it witnesses. 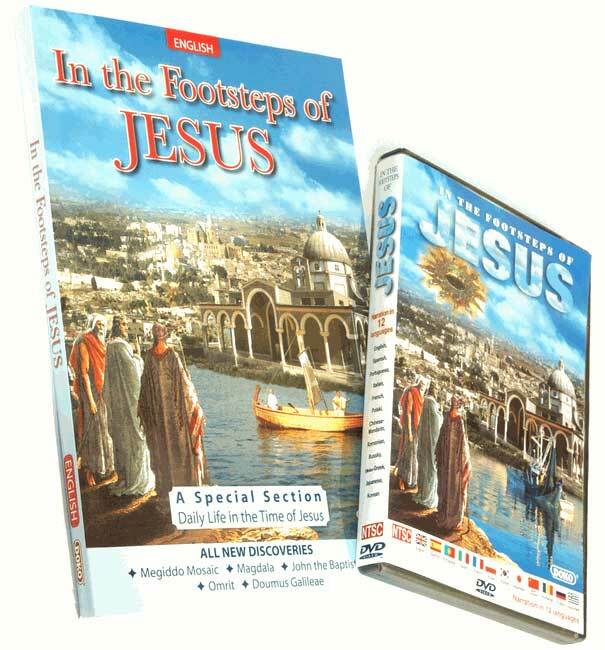 "In the Footsteps of Jesus" turns the printed text into a living one so that you can not only now imagine it, but actually experience it.
? His teachings and works: the monastery of John the Baptist, the wastelands by the Dead Sea, Qumran (where the Dead Sea Scrolls were discovered and the forerunners of modern Christianity dwelled), the Jordan River and modern baptisms, the Mountain of Temptation overlooking Jericho, the wedding feast at Cana, St. Anne's and the pools of Bethesda, the Samaritan well on Mt. Gerizim and a modern Samaritan Passover, Capernaum and the synagogue, Mt. Tabor and the Basilica of the Transfiguration, the Church of the Beatitudes, the synagogue-turned-church Chorizin on the waters of the Galilee, Tiberias' Hamat Synagogue, Damascus Gate in Jerusalem, Bethany, a Palm Sunday procession through the Lion's Gate (St. Stephen's Gate) in Jerusalem, the tear-drop shaped Dominus Flevit, the rarely seen interior of the Dome of the Rock mosque (Rock of Isaac), Mt. Zion, Zion Gate, the Garden of Gethsemane, the Russian church of St. Mary Magdalene, St. Peter of Gallicantu and the underground caves (where archaeologists believe Jesus may have been held prisoner), the Via Dolorosa, Eche Homo convent of the sisters of Zion, Calvary, the Holy Sepulchre, the garden tomb, and back to the Sea of Galilee for breakfast with fishermen. . .